Your resume is a business document, so it must be professional. Your resume is no place for gimmicks, colored fonts, pictures, or funny e-mail addresses. You may think it looks great, but your employer may disagree. Stick to the facts and keep it professional! A well-written, concise resume will make a greater impression with your employer than a long-winded “padded” resume. Use positive action words and start each bullet point with an action verb. On the same hand, avoid everyday buzzwords. Remember, your resume needs to focus on your key skills and achievements. Words such as “hard worker,” “reliable” and “ambitious” can have a more detrimental effect on your resume as these words are seen as adding no value to the resume. Do not be scared to highlight your skills, accomplishments, and abilities. If you don’t tell the employer, no one else will. Emphasize your skills, especially the ones the job is asking for. An employer wants to know you have the relevant skills for that particular job. Very important – the one-size fits all approach does not work here. Every job is different, and depending on what the job is, you need to make sure you tweak your resume (and cover letter) for that particular job. Ask yourself, “What job am I going for, and does my resume have the skills and strengths required to present to my future employer?” Tailoring your resume to the specific job you’re going for will show the hiring manager you are serious about working for their organization. Quality not quantity! Stick to the facts— using irrelevant data, waffling, and padding your resume are detrimental. Forget about fancy fonts or clever uses of italics. Keep it simple. Not only can it be hard to read, there are multiple scanning software programs that might be unable to read it, meaning it will end up being deleted before even being opened. Every word program these days has spell check—USE IT! Poor spelling and grammar will immediately land your resume in the “deleted items” box. Re-read every word yourself, and get someone else to read it as well. Be consistent throughout your resume with your margins, fonts, and line spacing. Consistency shows professionalism. Unless you are directly asked about money, do not mention it. Need a little inspiration for your resume? Click here to download the format for a resume and fill in your information! Introduce yourself with your major and your year at Georgetown. Mention the title of the position that you’re applying for and how you heard about the position. Be sure to address the specific individual who will be reviewing your application and customize the cover letter for the given employer. Relate the job to your own interests and experience to show a genuine interest in the employer. Focus on what you can contribute to the company and what specific skills you can add. Focus on why the company needs you, not why you need the company. Do some background research on the company/ organization so that you can highlight where your values align. 4. How are you qualified? Research the position and learn what specific skills and achievements the employer is looking for in a candidate. Use this as a base to demonstrate how your skills and achievements make you a qualified applicant. Isolate three to four specific skills relevant to the job and use anecdotes that highlight how you’ve made an impact in your prior experiences. Try to use some similar terms from the job description to show consistency between your qualifications and the requirements for the position. - Be personal: Show a bit of who you are through your writing and keep the reader engaged--but don’t reveal too much, save some mystery for the interview! 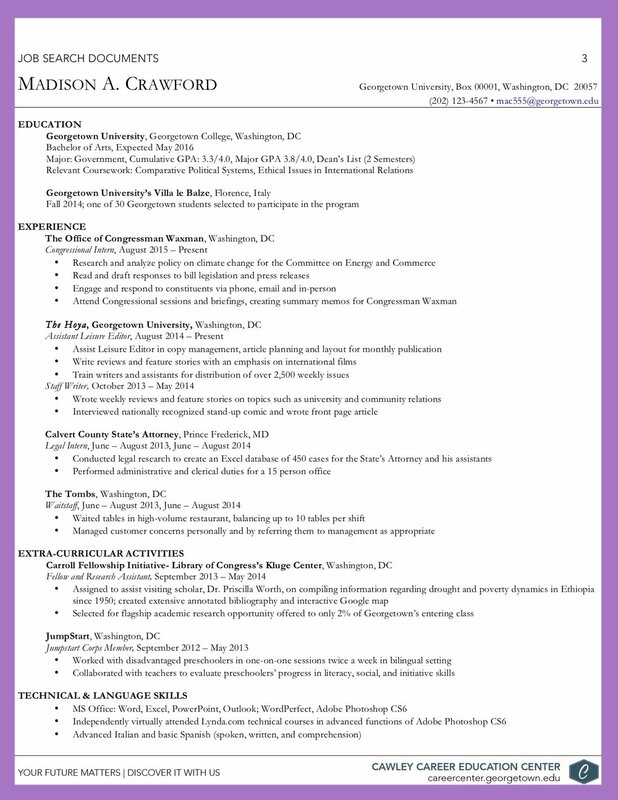 - Be consistent: Follow similar font and formatting of your resume to demonstrate consistency. Align all text on the left side, no need to indent! - Be professional: Don’t include emojis, abbreviations (lol, idk), anything that you would write in a text. - Use your resources: Have friends or advisors review your cover letter for any errors! - Keep your writing concise: An ideal cover letter should be 3 to 4 short paragraphs!